Do You Need More Muscle? Building muscle should be a priority for everyone especially for adults over the age of 22 to 25. Around this time you started to lose muscle cells. When you lose muscle cells you lose muscle mass. When you lose muscle mass two important measures start to erode: 1. Metabolic Rate and 2. Muscle Strength. When your metabolism slows down, it becomes much easier to put a layer of fat on your body that you simply don’t need (or want). Worse yet you’re likely lining your organs with fat, which has serious long term health considerations. One thing you might not be aware of is that your body interprets the deposit of fat on your organs as a stressor. This stress in turn sets off a series of biological processes that make you more likely to store more fat (both the fat that you see on your body as well as the fat you don’t see on your organs). So fat triggers a stress response which in turn stimulates more fat storage which, you guessed it, produces more stress (Nice cycle eh?). Here’s what you probably don’t know. Chronic stress shrinks your brain (yeah, read that again... your brain gets smaller and likely less integrated). Stress also shrivels the ends of your chromosomes in your cells accelerating cellular aging and predisposes you to anxiety and depression to point a just a few negative effects of stress. The physical stress of fat is obviously just one piece to a larger puzzle but for many this is a serious obstacle. Many live in what is now frequently being called an obesity epidemic, at least that’s what a broad selection of experts on the subject matter tell us. This lowering of your metabolism is one of the major problems because week to week you are likely to eat about the same amount of food. If you are losing muscle cells week in and week out you don’t need as many calories. Those extra calories, as we all know, end up in places that you don’t want - especially if you’re biologically functioning in chronic stress. Oddly it appears that the larger the belly, the greater the duration of stress and thus the smaller and less integrated the brain becomes. Yes, all this just from losing muscle mass and this is just a sliver of the impact of losing muscle mass. Take a deep breath and liberate yourself from your habits of mind around what you prefer and how you relate to your lifestyle. You need muscle mass. Muscles are like a sponge soaking up nutrients that you consume. 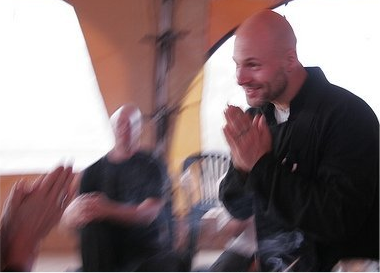 Simultaneously they are like a furnace creating immense amounts of heat burning off stress through movement. Generally speaking the more muscle you have, the greater the effects. As such, your life and the quality of your life is in many ways dependent upon your muscle mass. Your life and the quality of your life is in many ways dependent upon your muscle mass. If you’re concerned about getting big and bulky muscles, remember muscles are the engines of what keeps us all lean. Adding 2 lbs of muscle will burn about 10 lbs of fat over the course of the year. That’s losing 8 lbs the healthy sane way. The interesting truth is that if you’re trading in fat for muscle, you get smaller, not bigger. Muscle is immensely dense, fat spreads out and takes up lots of space. Lose fat and gain muscle and you will see your measurements go down. As a long term strategy (I am talking about spread out over 2-10 years you can augment training methodologies that heighten the cultivation of size or avoid size gains. Most elite athletes avoid size gains like the plague, yet they train rigorously. If you don’t want to get bigger over the long run (once you have gotten most of the fat off your body and organs), there are many intelligent approaches to keeping your muscles powerful and efficient without gaining size. If you are like most adults though, you need more mass right now. Muscle strength cannot be reduced to a “macho” thing that you may or may not not be attracted to. The larger truth relevant for everyone is this: You need muscle strength, this is a pragmatic fact. If you don’t believe me go volunteer at a nursing home for a week. It will dramatically change your perception of strength and what happens to your quality of life when you can’t move around freely. Muscle strength determines freedom of movement perhaps more than any other single factor and science tells us that strength is positively correlated with quality of life. When you lose strength you also lose quality of your life. It’s that simple. One of the questions everyone is wise to address is this: Does your day to day lifestyle increase your capacity to move about freely with greater ease and more flexibility? If you can not say yes to this, consider breaking out of your conditioned lifestyle that presently holds you. If you are not moving towards becoming more, then you’re slowly, or perhaps not so slowly, eroding the quality of your life. Strength and metabolism do not have to decline with age. In fact, it appears that these decline more in concert with lifestyle than with your chronological age. Strength training is a massively (perhaps the most) powerful way to reverse both of these measures as you grow older. 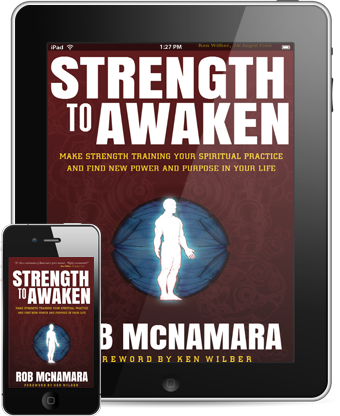 Strength To Awaken is the most integrated approach to strength training you will find on the planet. Greater integration means greater results. Train smart, learn to engage whole-heartedly into the discipline of strength training as this book does and you will enjoy multifaceted adaptations that will likely serve every facet of your life.